William is an active 3- year old with some developmental delay. At 2 ½ years we got a diagnosis of mild PDD-NOS (on the Autism Spectrum). He isn’t talking much (maybe 10 words), but has always been above average on physical milestones (until lately). William also has a sleep disorder that makes the household tired and sleepy! He has been going to sleep with little trouble, but he rarely sleeps longer than 5 hours at a time. Usually, at about 1am, he is up for the night! He has been in therapies since he was about a year and a half, but they haven’t seemed to help. We started noticing tremors in his hands while he was trying use a spoon within the past 3-4 months. Then it progressed to his legs. Not long after that, William stopped walking all together. He would just crawl and we took him to the ER for evaluation. Nothing was found to cause his inability to walk, but it lasted about three days. After this episode, William progressively got worse with balance, falling, tremors, possible seizures. He was prescribed Keppra (an anti-seizure med). It doesn’t take away the tremors but it may help contain them? Tremors and jerkiness with unsteady gait and unbalanced motor skills are worse when tired or trying to mentally accomplish a task, for example stacking blocks. And then there are many times his legs just give and he falls. This is progressing while he is at rest. William’s pediatric neurologist in Arkansas suggested a motion disorder specialist at St. Louis Children’s Hospital, Dr. Barry Schlagger. 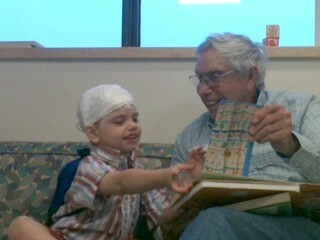 Dr. Schlagger gave us an appointment but wanted William to have an in-patient 48-hour videoed EEG. The doctor wanted the test results before the scheduled office visit at the end of May. William was admitted to St. Louis Children’s Hospital on Monday, March 26. The leads were attached to his head (not fun!) and the wires ran into a backpack which was attached with a line to the wall. It wasn’t as bad as we expected, as William got used to his head being wrapped and the test lasted only a little over 24 hours. They got the information they needed and stopped the test. An MRI was scheduled on Tuesday. It was a feat to get this scheduled so quickly and required some string- pulling, but Dr. Schlagger made it happen. The MRI showed he was having electrical spikes in his brain, but these weren’t related to the episodes of falling. While he was sedated for the MRI, they did a lumbar puncture and took a good amount of blood. We really appreciated that they put him out with gas before inserting the IV! They sent some of the testing to Seattle, some to Emory, and some to other places that I can’t remember. They are doing a broad spectrum of tests and maximizing the hospitalization and trip. They brought a team of physicians together to review/evaluate William. This team approach reminded me of “House,” but thankfully Dr. Schlagger is nicer! The head of many departments had their “go” at William. The epilepsy neurologist ruled out that he was having seizures, but said he might or might not have some in the future. (We thought that was definitive! NOT!) The Ophthalmology Department did an eye exam while William was sedated and thought they found something. We met with the head of that department and scheduled another test in May when we are there to see Dr. Schlagger. I can’t really count the number of doctors who saw William, but I was thankful for every one of them. Someone cared enough to arrange all this!! You just can’t imagine how much that means to us. They put William on Klonopin in addition to Keppra. It does seem to help with his tremors/shakiness, and they tried to get the dosage regulated before we left the hospital. The new medication also helped him sleep through the night, and there was a glimmer of hope. However, the doctors busted the bubble when they said his body would get used to the new med, and it wouldn’t affect his sleeping before long. I don’t think we are going to get a definite diagnosis before all the tests come back, but we did get a bunch of stuff ruled out. That’s good. This is a process, but for once we feel we are on the right track. We are on our way back to Arkansas with a good feeling about the experience! William and Braley right after he got the leads on his head. He was TRAUMATIZED!! He got used to the situation before long, though. PawPaw really came through as a distraction!